Built by Galpin Auto Sports in Van Nuys, California and dreamt up by Barris Kustom Industries the Ford F-150 Crime Fighter is a custom truck reminiscent of the 1966 Batmobile in appearance. The first thing you notice on this truck is the side rails which are built to look like wings and the tuxedo black custom paint job with hard to miss highlights in Ferrari red along the body. Normally, the F-150 sells for just under $34,000 but the modifications and additions discussed below add on another $30,000. There are many unique features to the F-150 Crime Fighter including the 24-inch rims, BAKFLIP tonneau cover, MagnaFlow dual exhaust system, and Ground Force lowering kit. The bed can be opened and folded from either the front of the back of the pickup and the aluminum mesh grill was specially designed to look aggressive while coming up behind another vehicle. When it comes to the inside of the car, the seats are heated leather seats and there is tons of red accenting on the piping, dashboard, and console which makes for an attractive interior look. The differences in performance between the traditional F-150 and the Crime Fighter are fairly substantial. There were no significant changes made to the engine but a supercharger can be added on if desired. The tires are wider and have a better grip which means it is easier to turn at higher speeds and handles well. The suspension feels stiffer than a traditional F-150 as the truck is lowered but it is something that drivers could likely get used to. Otherwise, the truck is almost the same in terms of performance. It is clearly the unique appearance where this truck shines. 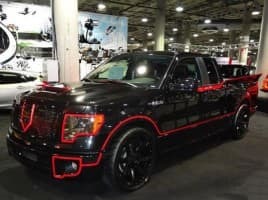 This truck was unveiled at Comic-Con in San Diego in August 2013 and Galpin Auto Sports is already receiving custom orders for Crime Fighters. Other features that Galpin Auto Sports highlights on their website about this unique creation include: Barris Custom Fiberglass, Streetscene Custom Bumper Cover, Barris Bed Rail Wings, and Hood and Steel Grille. Whether you are a car fan or a comic book fan, this is a truly one of kind, custom truck to see. Imagine the Batmobile in pickup truck format driving around your hometown and the F-150 Crime Fighter is what you would see.